5 x 6 CM. 5 x 9 CM. The Rexpeed Vortex Generator is made from PU material which is available in all colors and comes with 3M adhesives for easy install. Rexpeed uses factory paint with clear coat finish. The Vortex generator helps direct air towards the rear wing to create more downforce which in turn helps reduce turbulance. 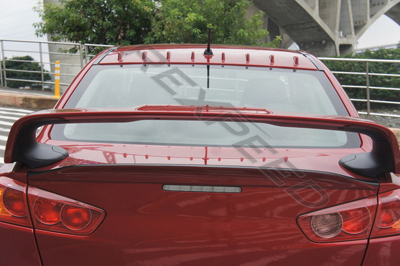 TECH TIP: The Rexpeed Painted Vortex Generator will fit Evo X MR Touring Model with the flat roof only. Some Evo X models have hump on the roof which will not fit so please double check before you purchase. This vortex generator will only fit models with antenna base size 5x6cm. If your antenna base size is the larger version which is 5x9cm it will not fit. If you do not see the color you want in the pull down menu and want us to paint it another color we can do that for you. In the notes section when you check out just provide the correct color code. We do not have all colors in stock so these will be made to order which takes 1-2 weeks to have it painted.